Our lessons programs run year-round. You are welcome to start lessons in the middle or near the end of the month – you do not have to wait for the beginning of the month to start. We offer basic western horseback riding lessons for the beginner rider as well as advanced lessons for the more experienced rider. We place an emphasis on playday events and barrel racing, allowing some of our students the opportunity to compete at local barrel races on our lesson horses. We offer both group and private lessons. No matter the option you decide to go with, they are both formatted the same. When students arrive for their lesson, they will brush their horse and prepare him to be saddled. They will learn how to saddle, bridle, and lead the horse on their own and then will proceed to the arena for the riding portion. We teach each lesson according to each individual rider’s skill and interest level. At the end of each lesson, students will unsaddle and brush down their horse. Emphasis is placed on safety and having fun! 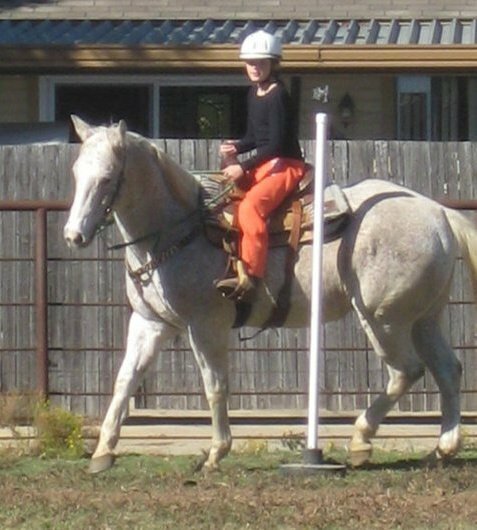 15-min leadline lessons are offered for ages 2 and 3. We require 30-min private lessons for our 4 and 5-year-old students until they are safely ready to advance into a group setting. Ages 6 and up can go straight into the group lesson program. Adult lessons currently taking place on Thursday evenings. Homeschooling classes are being scheduled now! Group lessons carry a flat monthly rate of $200 (averages to be $46-47/lesson when you consider some months have 5 riding days instead of 4) and all riding groups are small (3-5 riders per group). We strive to place each student into the appropriate group according to their age and skill level. Private lesson rates vary by length of lesson. Please contact Stephanie at 817-223-6036 for pricing. Please remember that there is a 24-hour cancellation notice or you will be charged for the lesson.